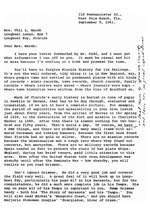 Folder: Correspondence-Marsh, Mrs. Phil L.
I have your letter forwarded by Mr. Kidd, and I must get . or miss because I'm working on a book and pressed for time. You'll have to forgive Florida History for its failings. where town histories were written from the time of Bradford on. dred and fifty years. That's quite a gap. Of course_ we have . Spain needed no fort to protect the route of her plate ships. realize as you read Grismer. Marjorie Stoneman Douglas' "Everglades, River of Grass." was a mound or were mounds on the Key, I suggest you write Dr.
was represented, whether you would be safe in assuming Mrs.
of the people on the Long Boat Key. much more about these events in his Tampa than in his Sarasota. The Sara DeSoto story, of course, is pure invention. cobaga Indians in the Tampa Bay area. is reflected in Grismer's map in Tampa, P. 33.
neither fleets nor galleons had put in for three years past." dians." His text, quotes and notes will be very valuable to you. forced into the Seminole ranks at the time of the Seminole war. bad, they're very likely to say he's descended from Caloosas. "Captain Bunce's Tampa Bay Fisheries." Coast attracted the Havana fisherman in Spanish times. these half-breeds incorporated the Calusa element." He does not give his authority. told them they thought -"
run after the channels had bean dredged between there and Tampa. twenty houses in 1899, and her population in 1912 was only 840.
built the causeway and put on his development there in 1925.
marks, but a friend in Vero Beach is interested in recent ones. Sarasota County cut from Manatee County in 1921. I enclose the correspondence with map. out, or, that failing, the Sarasota Post Office. the Everglades must have hampered their operations considerably. questions come up I suggest you get in touch with Dr. James W.
Covington of the Department of History at the University of Tampa. through Grismer's Sarasota carefully for both material and clues. Tampa Herald started as far back as 1850.
development. They could tell you what it was like before. And this is all the help I can give you. Good luck to you!